Lyle: You can see I stuck to the G minor theme in this solo. I used G Dorian, the minor pentatonic, and the Gm7 arpeggio mostly. 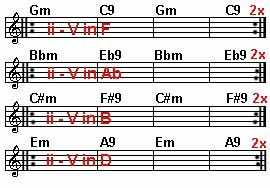 I also used the C major arpeggio, which is the V in the key of F. I hope you can pull ideas from it, even if playing/copying some of the riffs is hard. Lyle: Be sure to "listen and watch" the TAB file so you get a better idea in your head how these scales work against the jam. Lyle: Now you're playing the C#m to F#9, which are the ii - V in the key of B! Lyle: Notice when you look at the virtual guitar neck playback the TAB file, you'll see all the notes in the key of B all over the neck, then you'll see the scale riffs being played. Lyle: These are the ii - V chords in D major, so you can play any mode in the key of D against these two chords. Lyle: This should look familiar, you just learned all four of these keys in that order. Lyle: The best advice I can give you as you practice improvising over all four keys, is to keep it simple and bluesy, use the minor pentatonic and play your favorite blues riffs during each key. Just remember to move to the new key!